I had some leftover pakoras from the party. Usually I make a sabzi / curry with them. Today I tried out chaat for a change. Any kind of chaat is always a treat. 1. Spread the pakoras in a plate. If they are big you can break them into bite size pieces. 2. Whisk the yogurt with a little salt and sugar to balance the taste. 3. Pour it over the pakoras. 4. Spoon the mint chutney and tamarind chutney. 5. Sprinkle the chaat masala, bhuna jeera powder, red chilli powder. 6. Garnish with thin sev and coriander leaves. Oh this is a great idea for using up pakoras! Will be bookmarking this one. Yummmy yummy. I love CHAATS and this one looks finger licking good. Wonderful use of left over pakoras. I am simply pulling up ur dining chair, and joining u....cant stop myself by having this chaat!!! 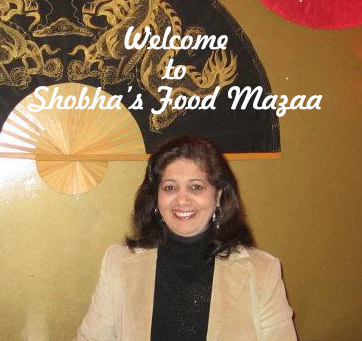 Delicous shobha!! Looks delish!! I Iove Pakodi chaat. Thanks for sharing. its taste yummy! thanks for sharing.